Loved this Suffolk Virginia Engagement Session ! George and Mary are the best of friends. They know how to laugh and enjoy the others company. When we met up with them in Suffolk Virginia , we immediately were drawn to their fun personalities. Mary is energetic, fun, and vibrant. George is more on the quiet side but he did bring us lots of laughs! Together they are super compatible and such a joy to hang out with. Engagement sessions can sometimes bring on the anxiety! It is usually the first time a couple meets us and of course they are going to be in front of the camera. So it is completely normal for couples to be nervous. Heck! I am nervous at times too! Mary said she was a little nervous on the way to Suffolk. George quietly laughed and agreed. However, within 5 minutes we felt we were hanging out with old friends. The nerves subsided and laughter and stories took its place. Cloudy and overcast days are beautiful too! The day of their session it was extremely overcast. We thought for sure a few times that the sky would open up on us. We even felt some sprinkling every now and then. However, the rain held off. I love shooting with the sun. It is my favorite. The warm glow that shows in the portraits is something I strive to achieve. With Mary and George’s session, there was no sun to be found. And that is okay. I love the overcast look in these photos and it makes cuddling up that more intimate and romantic! These two will be getting this Veterans Day. 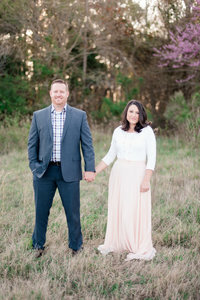 Their wedding will be in Chesapeake and we are so looking forward to this wedding! Not only because I LOVE November weddings but also to celebrate these two! It is going to be one happy celebration! Sharing some of our favorites from their session! Thank you Mary & George for trusting us! You two are so much fun and we cannot wait to see you in November! Mary says this is the norm in their relationship… Always stealing his hats and his clothes! Love this girl!